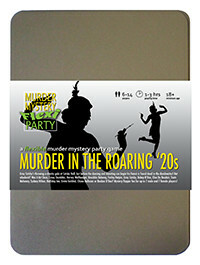 You've been invited to play the role of CHYNA BALLOONS in Murder in the Roaring '20s. Gray Catsby has invited his most talented and wealthy friends to a charity gala event at his countryside residence, Catsby Hall. But before any dancing and donations begin, Catsby’s fiancée, Ginger Whiskers, is found dead in the dumbwaiter! Join the flappers and dappers to find out who finished her off! As a dancer, you like wearing short dresses that accentuate your leg movements, with tassels or sequins that ripple to the music. A feather headband completes the look, along with a white balloon if you’re in the mood. Born Wedgewood Zeppelin, you were pressured by your parents to follow in their footsteps - as factory workers. But you knew there had to be a better way and sneaking into movie theatres and stage shows told you how. When you weren’t assembling wooden reindeers at the factory, you practised dance and balloon artistry. Your first show was a big hit and after you picked a new stage name - and paired up with Ginger - your success ballooned. Hey everyone, I’m Chyna Balloons, Ginger’s best friend and dance partner. We used to perform a lot together in the early days and now I’m just aghast she’s dead. I really wish I could have been there to protect her but I was in the first floor gymnasium at the time, practising my tassel spinning. You should see those things jiggle - it’s very vaudeville!